Killing Joke's best album in 11 years is a major surprise. While the other two LPs since their comeback (after a brief breakup in 1988) refocused the group on heavy guitars and contained several great songs, this time they put it all together. For good measure, they throw out the minor, pesky metal-isms that lurked throughout 1994's Pandemonium. 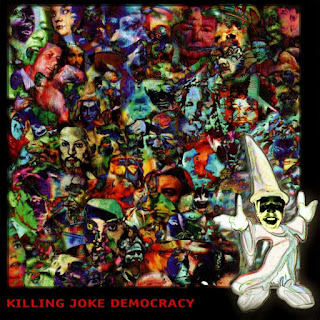 Instead, Democracy returns them to the assault and battery of their seminal, self-titled 1980 debut (and, like that classic, Killing Joke effectively play with tribal rhythms here, on the incessant "Intellect" and the hypnotic "Aeon"), only filtered through the bigger, larger, exalted guitar reverberation of their last truly incredible LP, 1985's Nighttime. Credit returned original bassist Youth (now a noted producer) for the dark, immense, bonfire sound of this monster. The choruses of "Democracy" and "Prozac People" storm, led by Jaz Coleman's maniacal, red-throated doomsday voice, and Geordie's apocalyptic chords. "Pilgrimage" duck-steps brilliantly with real swing. And best of all, the closing "Another Bloody Election" is a brutal, barbarous, bloodthirsty shellacking, the hardest, most vicious, ghastly onslaught they've ever perpetrated (and that's saying plenty), as Coleman fumes over the futility of the pathetic political process with an acute mixture of unchecked, furious ire and helplessness. It's just the final hammer blow of primal urgency from an 18-year-old band that has completely refound their singular thunder (the kind Nirvana filched for "Come as You Are," as per the settled lawsuit) on this, their tenth album.